After we filled up, Melle kicked things off, introducing the group to the business of domains, websites, and some of the underpinnings of our Internet as we know it and how that all works. Melle works for iwantmyname, which is a domain registrar based in Wellington, NZ, and spends her days helping people register their own domain names, get their websites or email set up or fixed, and documenting all the fiddly bits involved in that. This TED talk came recommended: The Internet could crash. We need a Plan B. It has an awesome anecdote at the beginning about the earliest days of email and websites, when registering a domain involved telling a buddy you wanted one, and he mentions the booklet that contained everyone who had an email address — all two dozen of them — and all their personal info. Did you know fraud is common in the domain industry? When you hear about sites having credit card information stolen, this is one area where thieves love to use those credit cards. They use them to register domain names, which they then use for a few things (aside from trying to transfer them right away to hide their tracks). They will try to sell them to make money, or put up crappy websites with lots of ads. Or commonly they will attempt scams like phishing. If you see a generic-looking email address registering something like “paypai.com”, good chance it’s a fraud attempt. These days common countries that are big sources of fraud include Turkey, Indonesia, Nigeria, Vietnam, Algeria, and to a lesser degree, Morocco and some of the former Russian states. So, you want your own domain name for a website or email. Did you know that the “www” part at the beginning of a URL isn’t actually part of the domain? mydomain.com is the domain name. www.mydomain.com is a subdomain, the same as blog.mydomain.com or shop.mydomain.com would be. So sparklekitty2010.blogpost.com or hipstermoustaches.tumblr.com or any of those free platform-supplied domain names are all subdomains, too. Once upon a time, when all was olde timey, we had but a few generic top level domain extensions (or gTLDs): .com, .org, .net, .info, .mobi, .name. You get the idea. Then a bit over a year ago, much preparation and discussion and auctioning and regulations and delegation bore fruit, and the new gTLDs started to be released. There’s over 500 of them now, covering places, professions, foods, fun, and weirdness. For example: .attorney, .beer, .clothing, .guru, .london, .photos, .pizza, .tech, .xyz, .wang, .wtf. (Yes, I do still giggle every time I see a .wang domain registered, because I am 10.) Of possible relevance, .science was launched the same day as our Dinner. For gTLDs, there’s one Big Boss organization, which is ICANN (International Corporation for Assigned Names and Numbers). It was incorporated in 1998 and is headquartered in Los Angeles. It remains US-based, which is sometimes a bone of contention, but so far discussions about moving it to make it more global haven’t actually made that happen. ICANN has contracts with domain registries, which are the companies that own/manage/sell TLDs. For example, VeriSign is responsible for .COM domains. Those registries sell domains to individuals or companies, or to reseller companies, which then sell them to the public. ICANN maintains consistent rules and policies for domain management: registration, transfer, renewal, formatting, etc. And of course they ultimately decide on which new TLDs get delegated from applications. (Though if there are multiple applicants it can be interesting determining who “wins”.) Google recently won .APP, which I’m sure Apple is real happy about. There can be second-level ccTLDs, like .CA, .JP, or .IO, and also third-level ones, like .CO.UK or .COM.AU. However, some registries have launched second-level ccTLDs within the last year. E.g. you can now register just .UK or .NZ. Some ccTLDs have become so common we forget they’re country codes, like .CO, .TV, .ME, or the geek popular .IO. Some are quite popular for domain hacks, e.g. spelling words using the domain extension, e.g. .ES or .IS. There hasn’t been nearly as much change among ccTLDs as gTLDs. After all, we’re not minting all that many new countries anymore. However, in the last few years, more IDNs (internationalized domain name) extensions have been released in non-Latin alphabets. For example, Egypt, Russia, and China all have their own domain extensions in the Arabic, Cyrillic, and Chinese alphabets. One other thing that ccTLDs sometimes support that gTLDs often don’t is emoji domains. Yes, you can have a domain that is a picture, rather than a written word. For example, “http://xn--ls8h.la” resolves as a picture of poop with the extension .LA. .WS and .TK are the other two that accept the most emojis. Coke recently made .WS emoji domain registrations quite popular with a campaign using them. Unfortunately, not all emojis are supported, some conflict with other types of icon code, some don’t work with certain browsers, and some cause issues with resolving and forwarding. But they can be pretty cute. And with millions and millions of .COM domains already registered, you’ve got to find your catchy and original domain somewhere. So, now you’ve figured out registering your domain name, and you want a website to go with it. All websites need somewhere to “live”, so you need to decide if you will provide that, or want a company to do it. Ultimately, what you need to know is that the domain needs to be connected at both ends (the domain end and the hosting end). Service platforms are companies that provide services like website hosting, storage, and often things like templates, ecommerce functions, etc. Some popular platforms for blogging, online stores, or portfolios are Blogger, Shopify, Squarespace, Zenfolio, Tumblr, Big Cartel, or Cargo. There are platforms for email as well, like Zoho, Google Apps, FastMail, etc. Some of these options are free for a basic account, then they have paid account tiers, which typically get you more storage, more features, more customization options, better support, etc. Often in addition to connecting your domain to one of these platforms, for security you have to verify that you own the domain. So, you have a domain name, and either a service platform hosting your site, or your own hosting setup. Now you have to connect your domain to it so people can find your site. This is often done using a wizard-type installer, or sometimes manually. 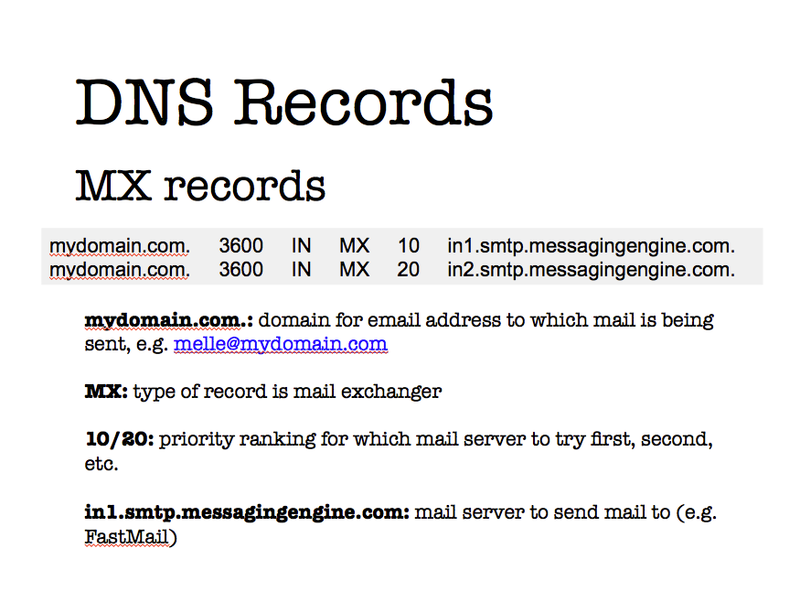 This is done with DNS (domain name system) records. 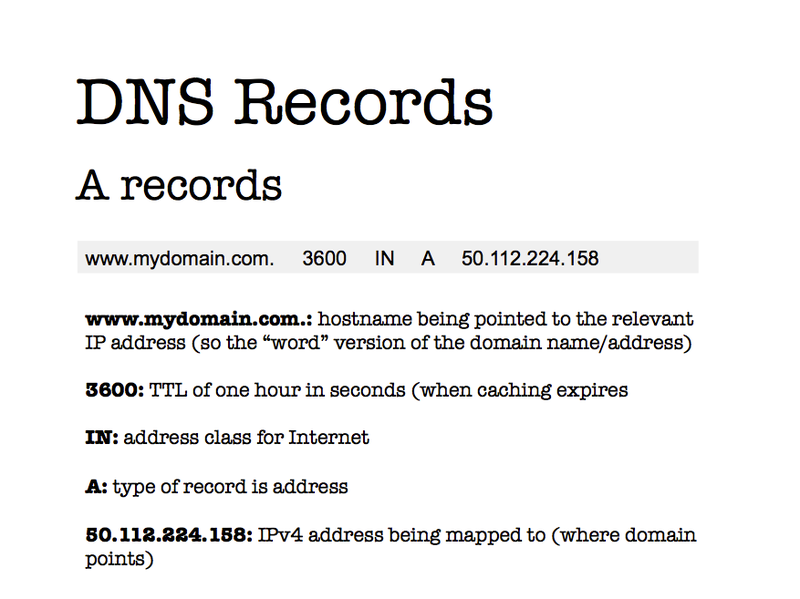 DNS is the protocol that translates domain names into IP addresses (“mydomain.com” into 198.185.158.144). It’s basically a big mapping system for the Internet that enables viewing and interacting with websites, pages, email, and pretty much whatever else you do in a browser. Not going to get into all of them, but will post the slides for the most common ones to give an idea of format, function, etc. More trivia: did you know that all domain names secretly have a dot at the end? 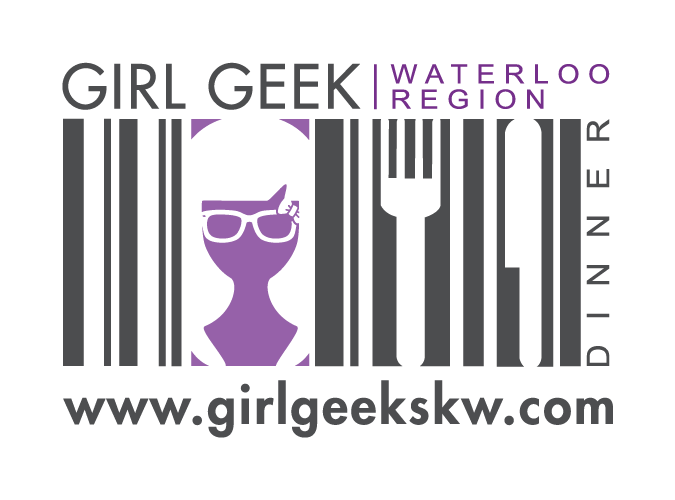 It’s expected and coded for, so we don’t have to use it, but this site, for example, is girlgeekskw.com. This relates to how the Internet was designed, and zone delegation. So, what exactly happens when I type in http://girlgeekskw.com/? Well, first off, no one types all that anymore. Almost no one even types in the www, and thanks to browsers you don’t have to. 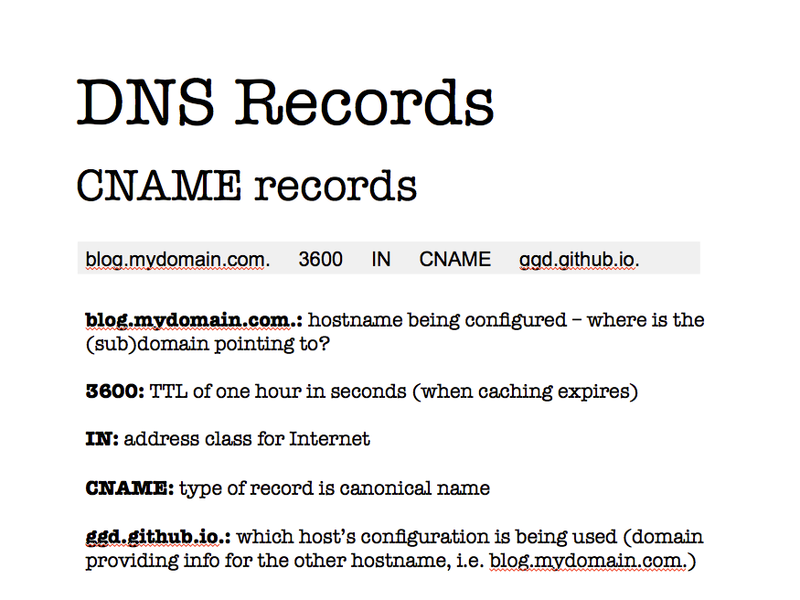 DNS setup typically adds records to enable visitors to get to your site using either the naked domain: girlgeekskw.com or the www subdomain: www.girlgeekskw.com. Now, not all browsers or apps, etc. are created equal. Safari, particular (especially mobile) doesn’t play well with many new gTLDs. Twitter didn’t used to, but is getting better. 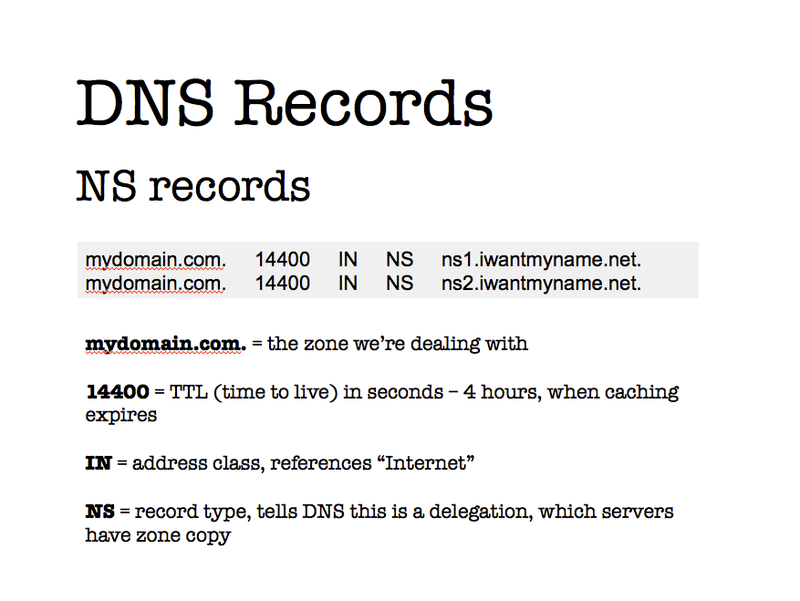 If you’re video-inclined, this is a good explanation of how DNS works, and, thus, what happens when you type in a domain name. It’s American and a tad political, but that’s relevant here, too. Basically, it boils down to, as aforementioned, every device on the Internet having an IP address. It’s a matter of connecting easier-to-remember domain names with those addresses, and providing the information needed to display a website, send an email, etc. IP addresses used to be in the IPv4 (version 4) format, but there was a great panic that we were shortly going to run out of those, so much work and effort was put into getting the IPv6 format out there, which gives us new IP addresses pretty much to infinity. So far the panic was moot, but we’ll need them eventually. The workhorse in all this running around, finding websites, is the resolver. “I’ve been asked to find girlgeekskw.com – do you know this domain?” And the resolver asks around, at progressively higher levels until a computer comes back with, “Yep, I know this information, here you go…” This is a very simplified explanation, of course. Resolvers aren’t authoritative, which means the domain/IP address info doesn’t ever reside on those computers. They can only ask for it, or return it once they get it. Host nameservers, root nameservers, registry servers, and IANA (Internet Assigned Numbers Authority – a division of ICANN) are authoritative. Resolvers can be on your computer, at your ISP, or elsewhere. Amazingly, the information about a site you want can be anywhere in the world, and the systems behind the Internet can inquire and retrieve it in the blink of an eye. Even back in the days of dial-up it’s pretty amazing how fast it all was. And with that, we end our overview of the business of the Internet. We’re hoping to be able to announce our March Dinner soon, so stay tuned!